Joyce Cobb is one of the best known and most-loved of performing Memphis musicians. She is an essential part of our musical fabric, contributing blues, jazz, rhythm and blues, folk and just plain good music to our community. Her name brings to mind a big smile, huge voice, quality in musicianship and depth in delivery. She’s carved out her place in the music profession as a performer, teacher and donator of her talent. Joyce first performed in her grandmother’s church in Okmulgee, Oklahoma – and she never forgot the warm response she received from the audience. She grew up listening to her parents’ excellent collection of jazz and classical music. But it was in her high school’s girls’ choir that she got her real start. Director Sister Mary de Lassis uncovered in Joyce a passion for singing that continues today. In Nashville, Joyce worked for WSM radio and TV for six years and opened at the Opry. She came to Memphis in 1976, lured by a contract with a Stax Records subsidiary but Stax folded shortly after her arrival. She worked for a month at the Holiday Inn and there met Wayne Crook and Warren Wagner. In talking with them she realized that her dream included songwriting, so she signed with their company, Shoe Productions. Her first song, “Dig the Gold,” was about the poorly paid black gold miners of South Africa. The song earned a number 42 spot in Billboard magazine. 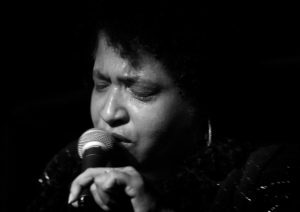 Joyce has run her own Beale Street jazz club and has toured nationally. She has won four Premier Player Awards for Best Female Singer from the Memphis chapter of the National Academy of Recording Arts and Sciences. She has recorded on several labels including RCA and Cream Records. In 1997 she hosted Beale Street Caravan, a nationally syndicated radio program highlighting the music of the Delta. She received Memphis Arts Council funding for the dynamic live program Beale Street Saturday Night, focusing on Memphis music. She has taught at the University of Memphis and the Community Music School. Joyce has volunteered with WEVL radio for more than 20 years. She has served on the program committee, currently serves on the board and hosts several shows. All this time, she’s been writing songs, sometimes spending as much as 12-15 hours a day in the studio. She now has 30 to 40 songs to her credit. Her biggest challenge has been to continue writing and performing her own material, but she has begun producing a CD on which she sings her own songs. Throughout her career, Joyce Cobb has shown initiative in music, business and education.